Chelsea defender Kenneth Omeruo hopes his loan spell at Kasimpasa in Turkey may earn him an international recall with Nigeria. Omeruo is on a season-long loan deal from the English Premier league club where he is yet to make his competitive debut. The 22-year-old is getting valuable uninterrupted game time in Turkey which he hopes will reignite his international career under Sunday Oliseh. "The only way I can earn a recall is to continue doing well with Kasimpasa and keep my place in the team," Omeruo, one of Chelsea's 32 players out on loan across Europe, told BBC Sport. "Injury has had a negative impact on my run with the Super Eagles and I would love to get back to playing for my country again. "My job is to keep progressing on and off the pitch, I don't want to look too far ahead," the 2013 Nations Cup winner added. 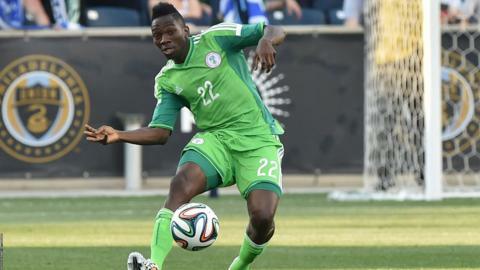 Omeruo was first called up by Nigeria in January 2013 and he went on to play at that year's Africa Cup of Nations and Confederations Cup - and at the 2014 World Cup. The centre-back has had a frustrating club career, spending last term on loan at Championship side Middlesbrough where a loss of form meant he lost his place and was down the pecking order. But the player says he is thriving at Kasimpasa and is revelling in playing regular football again. "I am enjoying it very much and the experience is great so far. "It has been good to get involved with a competitive club like Kasimpasa who are ranked among the best defensive sides in the Super Lig." With a run of 17 appearances for the Istanbul outfit this season, Omeruo has revived his club career and he is happy with how he is progressing at the Recep Tayyip Erdoğan Stadium. "I am enjoying my football playing every week and you just try to work hard and improve," he said. "Expectations are high because I come from a Premier League club, and every game you need to be switched on." A firm fixture in the side, such has been Omeruo's renaissance that the club are now exploring the option to buy him at the end of the loan. He joined Chelsea from Belgian side Standard Liege in 2012 and developed on loan at ADO Den Haag in Netherlands in an 18-month spell from 2012 to 2013. Omeruo made 14 appearances in his first loan spell at Boro after joining in January 2014 and returned for the whole of 2014/15 season where he made 22 appearances. Omeruo: Chelsea's best kept secret? Read more on Is Nigeria's Kenneth Omeruo Chelsea's best kept secret?